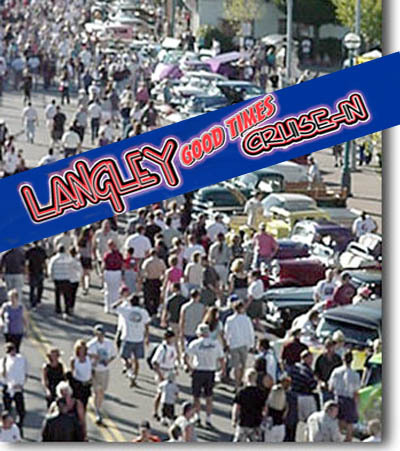 Put the 2011 Langley cruise in on your calendar in September. If you haven't heard of the Langley Good Times Cruise in, and you live in the Pacific Northwest, you've been missing an amazing car show. If you live a bit farther away, it's still one of the best exhibits of classic and performance cars anywhere and worth the trip! It's not just a Ford Mustang car show, but a huge classic and performance car event. In fact, it's grown to one of the largest car events in North America. And the best thing about it for 2011, is that it's back! Due to some major issues, in 2010, the event was canceled. But meetings, with the City and local police went well, and led to the announcement that this awesome show will return. If you're a fan of the classic Ford Mustang, be prepared to see a HUGE assortment of vehicles, ranging from full on trailer queen concours cars to daily driver 1965 Mustangs. That's not all, Mustang lovers can find lots of great examples of every kind of ponycars. Resto mods, race cars, Mustang 11, new Mustangs and of course a huge variety of Shelby Mustangs, Saleen cars, Roush and more. The scale of this huge outdoor car show, is amazing. It completely engulfs the little downtown of Langley, British Columbia, which is a short drive from Vancouver. And, it's only about 20 minutes north of the Washington - BC border. With some 100,000 odd people attending the weekend event, it's far from just a local car show. Thousands of top cars from all over North America and around the world, can be seen here. For Mustang enthusiasts, this place is a feast of eye candy. Every pony car you ever wanted can be found here. Probably in every color code Ford painted them too! Want to see exactly what you need for your car to be concours correct? Bring your camera. It's also a great way to get hard to find information you need to restore your Mustang or locate rare or unusual parts. If you got here, looking for car shows with every make and model of new, classic or fast cars, believe me, the 2011 Langley Cruise in is the place to see them. Its like taking a whole bunch of specific make cars shows and putting them all in one place! Go down one street and you'll find low riders. Go down another you see Harleys. Turn left and it's full of Cuda's and Challengers. Plus there's live entertainment, rock, country and even the perennial Elvis impersonators! Take the kids. It's a good fun for the family event for every car enthusiast. If you not only want to show your Mustang, you can sell it. Of course a for sale sign on the car with such a huge bunch of enthusiasts can generate some major interest. And you can put it up for sale at the swap meet and car corral on Sunday Sept 9th. It's located a couple blocks away, at the local community college lot and costs only 20 bucks. The 2011 Langley cruise in is not about money, it's about fun and helping local charities. This is a volunteer run event and all net proceeds from the show are donated! How cool is that? Bottom line, is the Langley cruise in is a must see event. Check it out!